(Bloomberg) -- Florida governor and Republican Senate candidate Rick Scott is suing two of his state’s counties and asking for an investigation of the tens of thousands of votes that are trickling in days after the election -- narrowing his lead into recount territory. Democrat incumbent Bill Nelson did not fully concede defeat in Tuesday’s election, even after Scott declared victory, and he has called for a recount. Now with two of the state’s most Democratic counties still filing unofficial results, Scott’s lead has shrunk to less than the half a percentage point that would allow for a recount. Most of the focus had turned to Broward County, a Democratic South Florida stronghold that -- mysteriously, according to critics -- was still adding up early voting and mail-in ballots Thursday. What’s more, there appeared to be an unusual discrepancy of some 25,000 votes between votes for governor and votes for senator, even though they were on the same ballot. 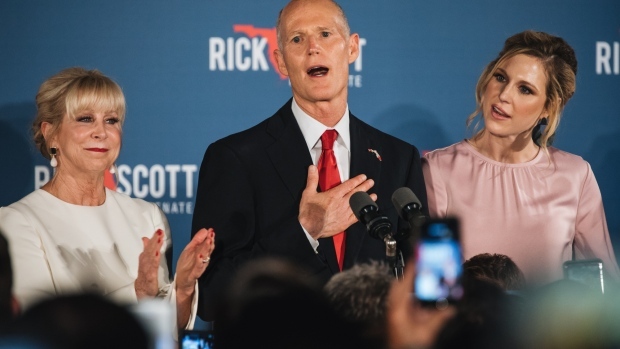 Scott announced Thursday night that his campaign had filed a lawsuit against the election supervisors in Broward and Palm Beach counties, and said voters "should be concerned there may be rampant fraud happening" in those two counties. He also said he is asking for a state investigation, although it was unclear if he was making that request in his capacity as governor or as a candidate. On Twitter, President Donald Trump also weighed in on the race, as he did often during the campaign. “Law Enforcement is looking into another big corruption scandal having to do with Election Fraud in #Broward and Palm Beach. Florida voted for Rick Scott!" Chuck Schumer, the New York Democrat and the Senate’s minority leader, countered with his own tweet late Thursday night. If a machine recount puts the results within a quarter of a percentage point, then the county canvassing boards would do a manual recount. Ballots from overseas civilians and members of the military will be counted if they were postmarked by Nov. 6 and arrive by Nov. 16. The official results of a manual recount would be due by Nov. 18. Florida elections are notorious for minuscule margins of victory and for allegations of improprieties at polling stations and in vote-counting. The state decided the 2000 presidential election when a Supreme Court decision halted a Florida recount and made Republican George W. Bush the winner over Vice President Al Gore. The governor’s race has also narrowed. Democrat Andrew Gillum trails Republican Ron DeSantis by less than half a percentage point, with some votes still to be counted. Gillum has said he is prepared for any outcome, including the possibility of a recount. --With assistance from Jonathan Levin.